No matter where a child lives in the state of California, there is a public school district obligated to provide him or her with a free public education. What do school districts do? How many school districts in California? Are mayors responsible for schools? What do school site councils do? When can the state take over a school district? How can I see my school district's budget? Think of the state as a jigsaw puzzle with the districts as the pieces. By the way, that puzzle has about 1,000 pieces, not counting the state's 58 County Offices of Education. For one, not all California school districts serve the full range of grade levels. Actually, only about a third of them are "unified" districts, meaning they include schools serving every grade level from pre-kindergarten to 12th grade. California has about 75 districts with only high schools. The rest are elementary districts, typically serving grades K-8. The state’s school districts vary tremendously in size. The smallest have as few as 20 students. The largest is Los Angeles Unified School District, which is responsible for educating more than 10% of the 6.2 million children attending California's public K-12 schools. In some ways, state law treats all of these districts the same. They are, for example, the "fiscal agents" for local school funds. Districts are responsible for passing an annual budget, hiring staff, submitting data to the state about their students, and much more. They are also required by state law to have a publicly elected school board. (When boards have vacancies, they can make appointments to fill them until the next regular election.) School boards are responsible for setting policy in a district and hiring the superintendent. The superintendent has the job of implementing policies, managing the district, and making all other hiring decisions. A bit of education jargon worth knowing is the term "Local Education Agency," usually abbreviated as LEA. Most LEAs are school districts, but county offices of education and charter schools (which are independent of districts) are also LEAs. The governance of charter schools is handled differently. See below and Lesson 5.5 for more on how charter schools are created and overseen, including information about Charter Management Organizations (CMOs), which are increasingly prevalent. Mayors? Nope. School boards? Yep. Most people are surprised to learn that mayors and other city officials have neither responsibility nor power when it comes to the operation of public schools. Most people are surprised to learn that mayors and other city officials have neither responsibility nor power when it comes to the operation of public schools. Schools are an independent fork of the executive branch of government, and they are usually governed by school boards that are independently elected. When citizens complain to a mayor about schools, the mayor's official role is to shuffle his or her feet and give the audience a lesson in municipal civics. In some places (mainly large cities outside of California) mayors play a role in school governance through appointment of members of the school board. This governance strategy is known as mayoral control. Local school boards can serve as agents for change. In some cities (for example, Houston and Los Angeles), citizen groups have invested enormous energy to field and support candidates with a shared agenda, such as whether to encourage or discourage formation of charter schools. In California, where Proposition 13 removed school boards’ authority to set tax rates, most school board elections have been relatively sleepy affairs with low voter turnout. The state and some federal programs require that school districts leave some decision making to individual school sites. Some districts concentrate decision authority in the central office; others devolve power to school leaders. The federal Every Student Succeeds Act requires that each school create a School Plan for Student Achievement to document how certain federal funds are spent. In California this federal requirement is matched by state requirements. 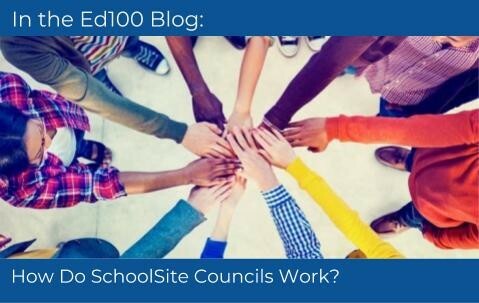 Every school should have an active site council, a topic that we explore in some detail in the Ed100 blog post How Do SchoolSite Councils Work? Schools with more than 21 English learners, and districts with more than 51, are legally required to have advisory committees. The relationship between school districts and their schools can vary enormously. Some districts concentrate decision authority in the central office; others devolve power to school leaders. Site level budgeting authority. This can be limited to supply budgets, or can include every part of school operations and personnel. Hiring decisions. In California these are often made at the district level; teachers may be assigned to schools without the principal having much say. Instructional decisions such as textbooks, grouping practices, and student support programs for low-achieving students. Special programs outside the regular school day, including parent education, after-school programs, and community partnerships. In a state as big as California there are always exceptions. For example, it seems that a few California districts are always experimenting with ways to give school sites more autonomy. Schools are locally administered, but not unconditionally. Ultimately, the California constitution obligates the state to provide for education. If a district fails abjectly, particularly through financial mismanagement, it can be placed under "state administration" until it gets its house in order. In these rare circumstances, the state appoints an Administrator, who combines the functions of the school board and the superintendent into a single office. Such "state takeovers" are quite rare in part for a practical reason: turning around a district in crisis is incredibly difficult, politically-charged work. Wherever possible, it is best for districts and boards to get their own house in order. In 2016, The California Legislature created the (CCEE) to provide "advice and assistance" to county offices of education, school districts, and charter schools in achieving their LCAP goals. As discussed in Lesson 5.5, California’s 1,000+ charter schools operate outside of this system of local governance. They receive their charter from a district, county office of education, or the state, but they do not have elected boards or prescribed attendance boundaries and students they must serve. They receive public monies but are freed from many of the rules set up in the state’s education code. They are accountable for performance and can be closed down by their chartering authority if they don’t meet certain goals or don’t operate in a financially responsible manner. Clearly, school districts serve a vital educational role, but they are also economically important as employers and service providers. Districts hire teachers, administrators, counselors, aides, and specialists. They plan and execute maintenance and upgrades of school facilities. They coordinate with city public services on everything from crossing guards to bus routes and schedules. The organizational structure and personnel investments of districts can differ a lot; in California the district financial reports on the Ed-Data Partnership website show how school districts allocate resources and allow comparisons. But high-level comparisons of staffing structures should be taken with some skepticism. Schools involve a lot of part-time roles, from crossing guard to band teacher to web site manager to department chair. Those nuances make comparisons wiggly. Also, because schools are different sizes, specialist roles like counseling are often shared across campuses. When comparing the organizational investments of different schools, it helps to think in terms of the number of full-time equivalent (FTE) positions associated with a role at a school. It also helps to compare that number to the number of students affected. Staffing ratios can often paint a picture more informative than a simple organization chart can provide. Which of the following education-related responsibilities typically fall under the jurisdiction of a mayor? Develop the school district budget, subject to approval of the School Board. Appoint members to the School Board when absences occur. The mayor rule the community city, but the public school was create for the community in middle of this. Well , today exist a big contradiction, because the school require the same physical necessities that the city, to care yards, the sewer system, privacy and many others things. in all these things the local authority don't have nothing to do. Many schools don't control the infestations or weeds propagation. What if all answers to those questions are false? We have 39,400 students and about 1600 teachers. Budget for last years was untrue. But still can't get answers to where money actually went. 2 people quit but still no answers.